They don’t make humans like they used to — quite literally. Living in social groups has led us to self-domesticate our species, new research finds. Image credits hairymuseummatt / Wikimedia. According to the hypothesis of human self-domestication, one of the forces that powered and steered our evolution was artificial selection in the cave, tribe, or hut. As we like to live with other people (and there’s no indication that this was ever different), prosocial behavior became valuable while antisocial behavior became increasingly shunned throughout our history — which created a selective evolutionary pressure for the former. New research, led by Professor Cedric Boeckx from the University of Barcelona, comes to offer genetic evidence in favor of this hypothesis. The goodest boy is you! Self-domestication is, in broad strokes, pretty much like regular domestication. Outwardly, it leads to a change in anatomical features — for example, imagine how dogs have adorable droopy ears and rounder heads while wolves have scary pointed ears and more angular heads. It also leads to behavioral changes, most notably a reduction in aggressiveness. The key difference, however, is that self-domestication of a species is done internally, if you will, without input from other species. It’s a process that several researchers believe helped shaped modern humans, as well as other species, such as bonobos. Up to now, however, we lacked any genetic evidence to help prop this hypothesis up. 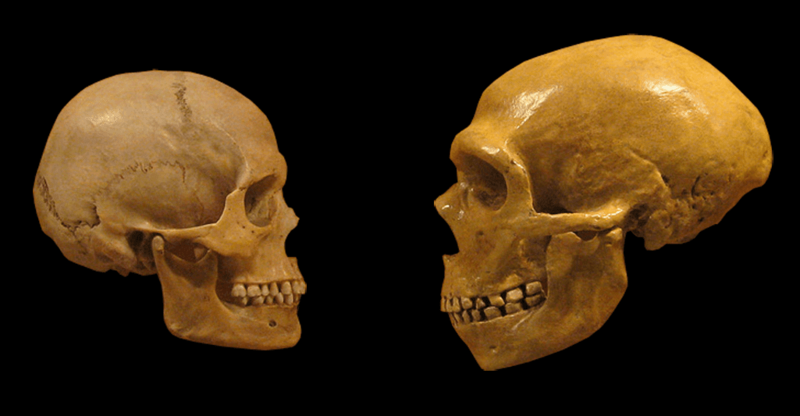 Boeckx’s team worked with the genomes of our extinct (and wild) Neanderthal or Denisovan relatives to try and determine whether humans have, in fact, domesticated themselves. They compared the genetic material from modern humans against that of several domesticated species and their wild type. The comparison aimed to find overlapping genes associated with domestication, such as those linked to docile behavior or gracile facial features. The researchers first compiled a list of domestication-associated genes in humans based on the comparison with Neanderthals and Denisovans, wild but extinct human species. Then, they compared this list to genomes from domesticated animals and their wild type. “One reason that made scientists claim that humans are self-domesticated lied within our behavior: modern humans are docile and tolerant, like domesticated species, our cooperative abilities and pro-social behaviour are key features of our modern cognition,” says Boeckx. “The second reason is that modern humans, when compared to Neanderthals, present a more gracile phenotype that resembles the one seen in domesticates when compared to their wild-type cousins,” added the expert. The phenotype represents an organism’s characteristics resulting from the interaction between its genes (genotype) and the environment. While the genotype dictates characteristics such as, let’s say, eye color, skin color, or maximum height, your phenotype is your actual height (a product of nutrition and genetics), your actual skin color (a product of exposure to sunlight and genetics), so on. As a rule of thumb, the genotype is the digital blueprint and the phenotype is what actually came out on the production line. The team used other statistical measures, including control species, to make sure they weren’t picking up on a fluke. Their aim was to rule out the possibility that these genes would randomly overlap between humans and domesticated animals, so they compared the genomes with species of great apes. “We found that chimpanzees, orangutans and gorillas do not show a significant overlap of genes under positive selection with domesticates. Therefore, it seems there is a ‘special’ intersection between humans and domesticated species, and we take this to be evidence for self-domestication,” Boeckx said. The paper “Self-domestication in Homo sapiens: Insights from comparative genomics” has been published in the journal PLOS One.